For the first time ever, biologists have documented evidence of two species of marine mammal breeding to produce a third in the wild -- originating in a stable new species no one realized was a hybrid until now. The genetic origins of Clymene dolphins, a short-snouted dolphin native to the mid-Atlantic, had long been a mystery, though they were assumed to be a subspecies of the taxonomically similar spinner dolphin. However, a new study has revealed that clymenes aren't your run-of-the-mill evolutionary offshoot, but rather the lovechild of a rare coupling. When researchers examined clymene DNA, they discovered markers from spinners, as was expected, but also those belonging to another species -- striped dolphins. They looked at both the DNA from the dolphins' mitochondria, the powerhouse of the cell, and the nuclei, the cells' command center. 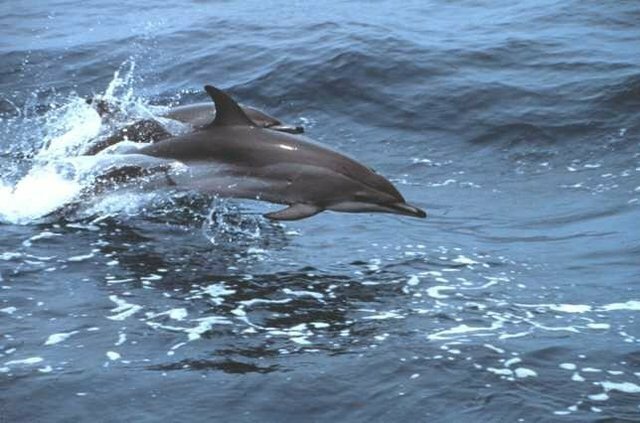 Their results suggested that the clymene dolphin's mitochondrial DNA is more closely related to that of the striped dolphin, while the nuclear DNA appears more closely related to the spinner dolphin, confirming the conflicting stories told by previous studies that also looked at genetic markers. In the current study, the researchers suggest this discrepancy is evidence of a hybrid origin for the clymene. Researchers believe that at some point, spinners and striped dolphins mated, setting in motion a new lineage that continues to thrive today -- a natural hybridization that is not only rare among mammals, but previously unheard of in marine mammals. "Our study represents the first such documented instance of a marine mammal species originating through the hybridization of two other species," says lead author Ana Amaral.